Recently my husband was selected for an awesome promotion at work! We are so proud of him so we decided to get him an early Christmas/congratulations gift! Now there are many things he loves but when we were shopping at Kohl’s we came across a perfect combination of two of them! Technology and Oral care! Don’t you judge 🙂 there are weirder things to like. When it comes to oral health, my husband is the pioneer! He introduced the boys to the flossing and tongue scraping and every day they already know what to do! One of them proposed that we get him a new toothbrush, so off we went to look for the perfect one! 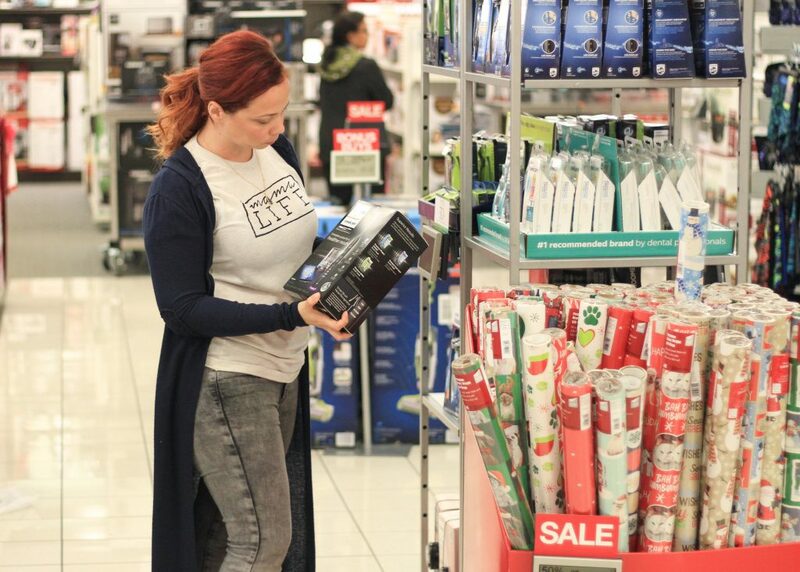 We saw the Sonicare DiamondClean Smart Electric Toothbrush and we all knew that it was the one! It’s the perfect gift for our tech-savvy guy! I will tell you why really soon! But first, we needed more things to make the gift grander! After all, he has worked so hard for this promotion. With the promotion also comes training, and traveling, so I decided that he should have a nice travel bag with all his favorite personal necessities. 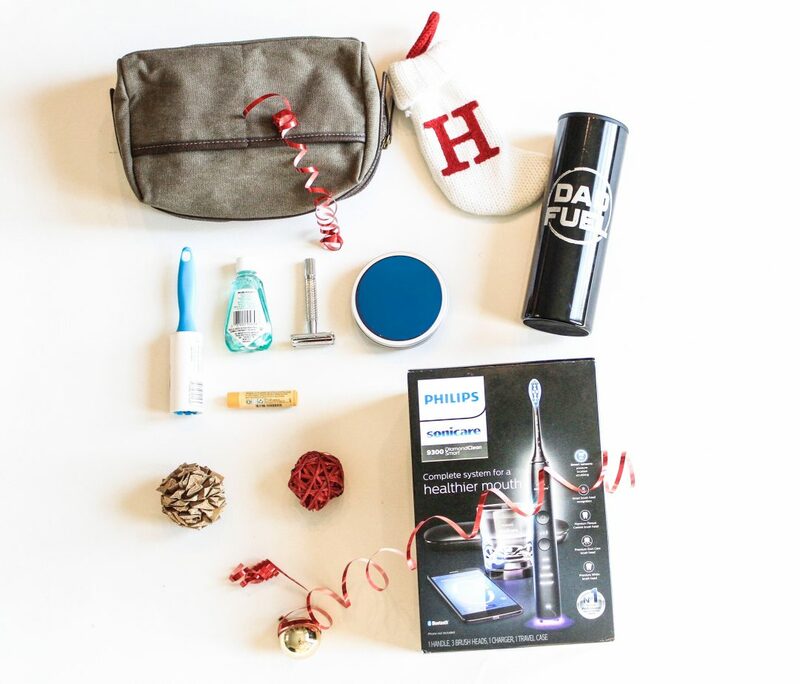 Even if the Sonicare toothbrush was the star of the gift, I know he will use all of it! Whenever we want to give him a gift, we like to focus on one thing we know he loves and get creative with things that complement that, it makes shopping easier and takes the stress of trying to come up with so many things, away. Here is a photo of the gift before we wrapped it. 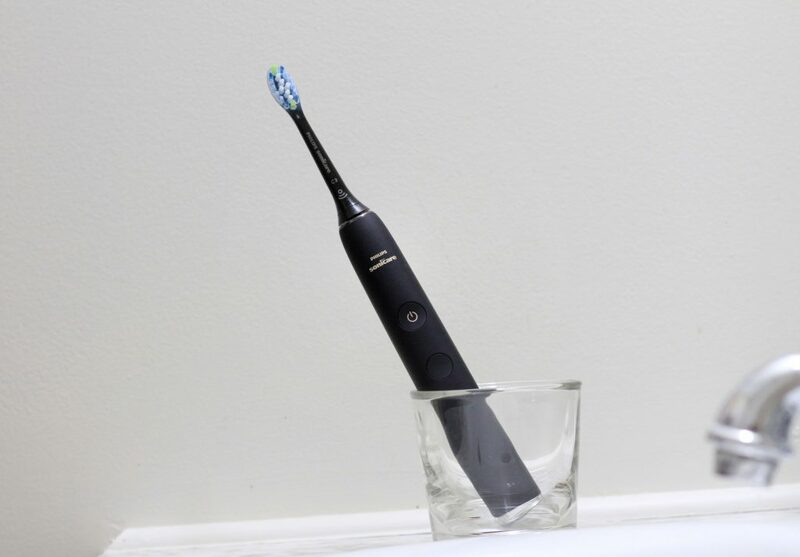 You can hover over it to be able to order your own Sonicare toothbrush! trust me when I say that you will want to. Coffee cup- because he works so hard and needs his daily caffeine to keep going on! Shaving balm and razor- so that he can look sharp every day and be able to make a great impression on his new peers and bosses. Mouthwash- so he can be confident and speak up when necessary, without fear of bad breath. His favorite lip balm- because a lot of his training will be done outside, in the dead of winter so I know he will need it every day. Lint Remover- to keep his uniform and suits always looking clean and sharp. Sonicare DiamondClean Smart toothbrush- because it’s the Number 1 dental professional recommended brand. It has 4 high-performance brush heads and smart sensor technology for personalized feedback and 100% confidence in his oral care. Every time. 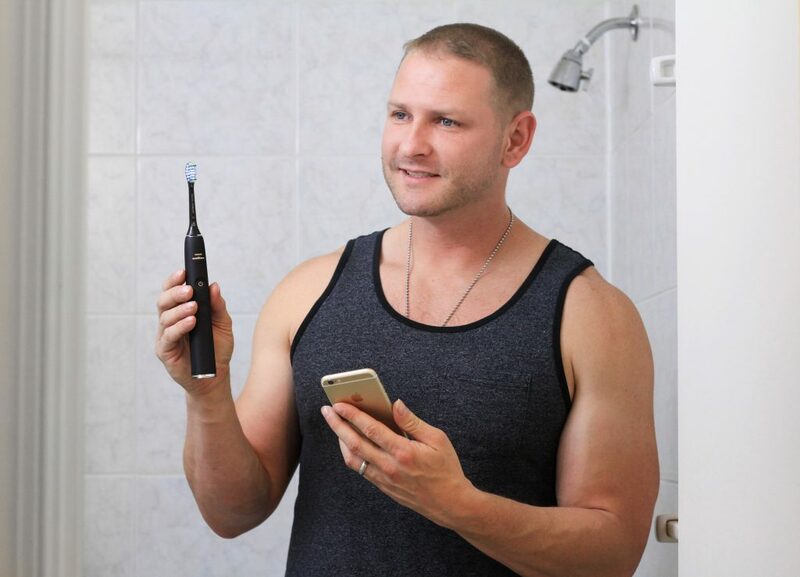 The combination of Oral health and technology is just perfect for him. Travel bag for all the goodies- so that he can easily carry everything with him on his trips and be able to keep taking over the world! We put all of the items into a nice gift box and wrapped up with colorful wrapping paper. Then we surprised him with it when he came home from work. Now for the fun part! Of course, he absolutely loved his gift! 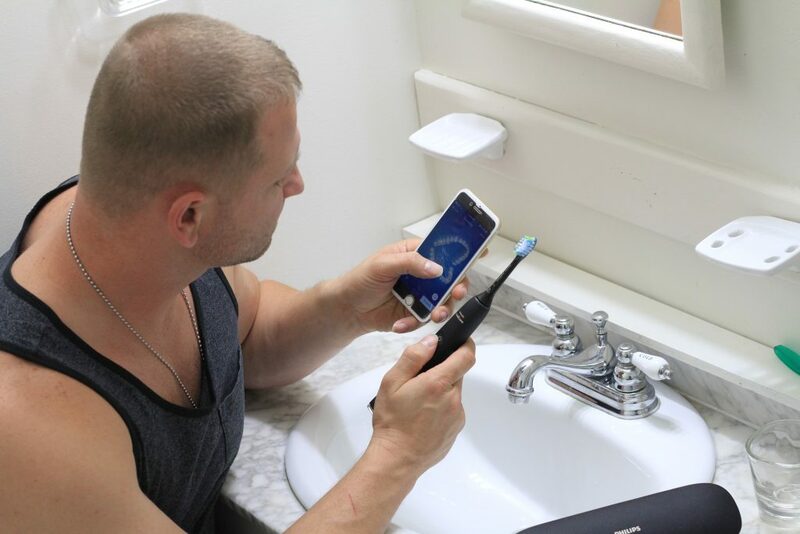 The toothbrush is equipped with Bluetooth and it has an app that you can download and use in combination with it. Our tech-savvy guy was over the moon and immediately decided that he needed to brush his teeth. We discovered that we had gotten the best ever toothbrush! 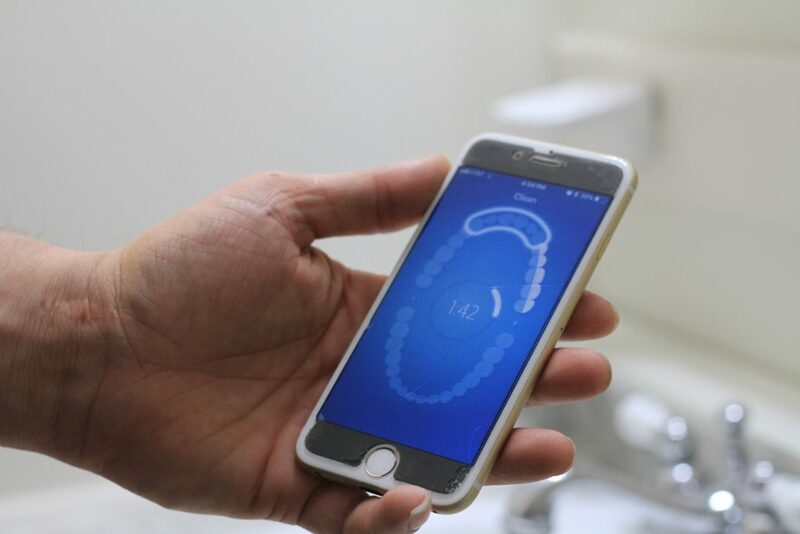 The app helps take care of every single tooth in your mouth and its sensor will let you know if you missed a spot. How cool is that? It’s like a personalized teeth brushing coach with Smart Sensor technology that will ensure that your teeth, gums, and tongue are taken care of. My husband now calls us into the bathroom constantly to show us how cool it is, so we would know. We all are so excited to have made him happy with this perfect gift! He deserves every smile. To learn more about this amazing brush, visit this site here. You will be amazed at all the cool features! This is definitely the perfect gift for a tech-savvy guy. What other gifts should we be on the lookout for? have ideas? share them in the comments!